They say that il n'y a que Paris. This is roughly true, however Paris last week was not the best place in France to learn about the latest dark matter news. Simultaneously to ICHEP'10 in Paris down south in Montpellier there was the IDM conference where most of the dark matter community was present. One especially interesting result presented there concerns the hunt for light dark matter particles. 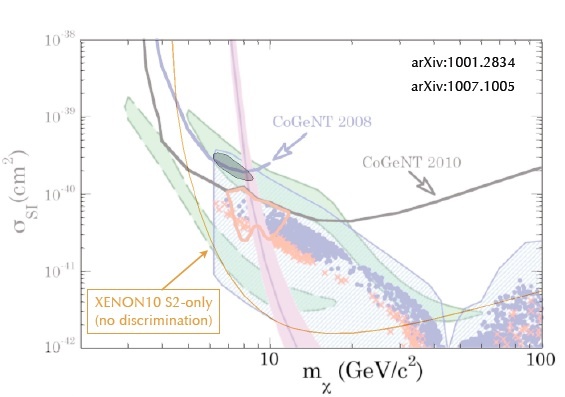 Some time ago the CoGeNT experiment noted that the events observed in their detector are consistent with scattering of dark matter particles of mass 5-10 GeV. Although CoGeNT could not exclude that they are background, the dark matter interpretation was tantalizing because the same dark matter particle can also fit (with a bit of stretching) the DAMA modulation signal and the oxygen band excess from CRESST. The possibility that dark matter particles could be so light caught experimenters with their trousers down. 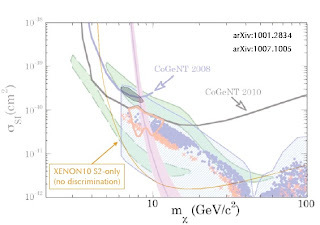 Most current experiments are designed to achieve the best sensitivity in the 100 GeV - 1 TeV ballpark, because of prejudices (weak scale supersymmetry) and some theoretical arguments (the WIMP miracle), even though certain theoretical frameworks (e.g asymmetric dark matter) predict dark matter sitting at a few GeV. In the low mass region the sensitivity of current techniques rapidly decreases. 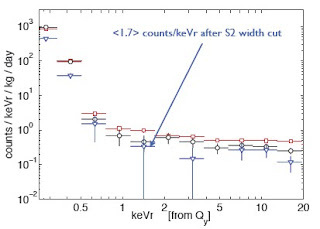 For example, experiments with xenon targets detect scintillation (S1) and ionization (S2) signals generated by particles scattering in a detector. Measuring both S1 and S2 ensures very good background rejection, however the scintillation signal is the main showstopper to lowering the detection threshold. Light dark matter particles can give only a tiny push to much heavier xenon atoms, and the experiment is able to collect only a few, if any, resulting scintillation photons. On top of that, the precise number of photons produced at low recoils (described by the notorious Leff parameter) is poorly known, and the subject is currently fiercely debated with knives, guns, and replies-to-comments-on-rebuttals. In that article the authors argue that light dark matter could help to explain certain experimental results about anomalies in solar seismology. When I read the article I saw that asymmetric dark was related to technicolor models so I didn't give it too chance. I had forgotten totally about the cogenet results and now that I see your post I think that it could be an independent hint for tat controversial results. um shouldn't XMASS be taking data with a massively huge fiducial volume that would make Xe100 irrelevant already? Last time I heard XMASS had some technical problems, though maybe they have recovered by now. In any case, they detect only the scintillation light, and no ionization, so it's not clear whether they can be better than Xenon100. There was also a talk by XMASS where they explained the ominous "engineering error" ... they had to reinforce the neck of their top flange which took quite some time, but it seems they are back on track now.